Joint Director of Kumaran Eye Specialty Clinic is a well trained Ophthalmic Surgeon in Anterior segment Surgery including Cataract (Phacoemulsification), Multifocal lenses, Squint, Orbit, Glaucoma and Medical Retina. He graduated from Kilpauk Medical College and had his Masters of Surgery (MS,Ophthalmology) Aravind Eye Hospital and Post-Graduate Institute of Ophthalmology, Madurai. After which he did his training in Member of Royal College of Ophthalmology (MRCO), London. Dr. M.Kumaran has performed more than 10,000 Cataract and IOL implant surgery and is a specialist in Phacoemulsification and Foldable IOL’s, Multifocal IOL, Squint, Orbit, Glaucoma and Medical Retinal diseases. He was awarded the “Knight of the Blind ” by Lions Club of Chennai in 2007 for his exemplary service in rendering vision for the underprivileged in Chennai city. 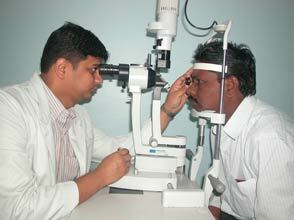 He had performed more than 1500 cataract cases in one year.